Silkboard junction has been identified as one of the worst traffic prone junctions in the whole of India!! So what does the govt do to handle it..they come up with an humungous plan to 'de-clutter' the junction with a maze of flyovers..
And this would cost close to 1000 crores. A metro interchange for the 2 lines coming there (Electronic city and KR puram) will make the place a major hub for sure and that being a mass public transport option is a welcome move. However the junction current road traffic need to be studied well to understand what the sollution is needed there. Both these problems are been addressed by the two metro lines meeting there. 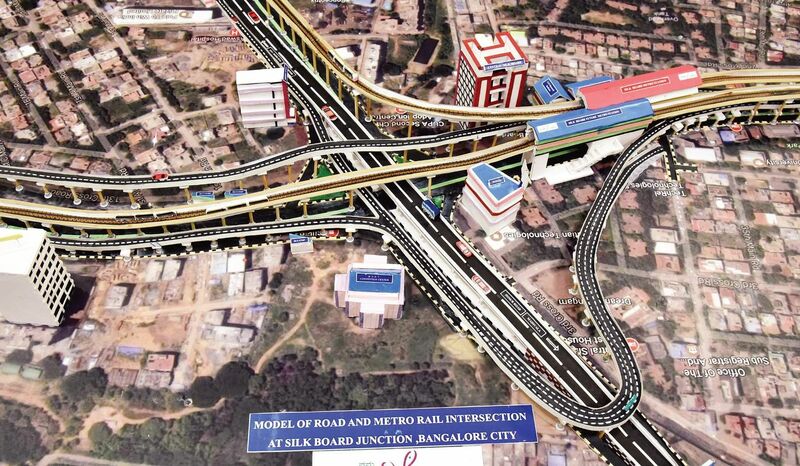 So after the metro starts plying there, the junction will automatically see a huge reduction in vehicular traffic. So why spend a 1000 crores for solving a problem which might not exisit in the future!?? A car centric American society, which has always talked about cars and sold cars everywhere, is talking drastic like this..
Potholes on Roads tarred one month back!! White topping - projected panacea? Underground Parking - whats the big deal? V and U needed for metro?